Thanks to our sisters and brothers of the 40YearsOn Committee in the United Kingdom. They have provided us with copies of the reprint of Chris Welch’s “Introduction to Chile, A Cartoon History” an original graphic novel covering the history of Chile from the Spanish Conquest and invasion of Abya Yala, to the right wing destabilization of the Salvador Allende government, and finally to the military coup of September 11, 1973. It will make an excellent gift to a loved one, especially a youth or young adult in your family that is looking to learn more about the history of Chile. 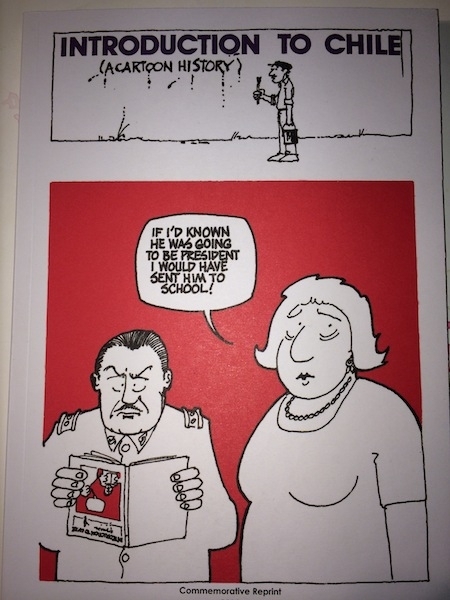 If you would like more information about the graphic novel or would like to pick up your copy in person please call Rodrigo at 780-293-8496. The Memoria Viva Society of Edmonton would like to call upon all groups who value democracy, equity, liberty, peace and justice to support the constitutional Bolivarian government of Venezuela and democratically elected President Nicolas Maduro. This past 12th of February opposition demonstrations throughout the country lead to destabilization and violence. The destabilization was organized by Villca Fernandez, the leader of the extreme right wing student movement; Leopoldo Lopez, leader of the extreme right political party “Voluntad Popular” and Maria Corina Machado, deputy of the National Assembly. These three opposition leaders summoned people to “take to the streets” in an attempt to destabilize and overthrow the democratically elected president. Shortly after the leaders of the opposition left the demonstrations, a violent attack against the office of the Public Ministry erupted with a small group of masked persons throwing rocks and homemade explosives. As a result, Juan “Juancho” Montoya, a community leader of the barrio “23 de Enero” (23 of January) and an opposition student “Basil De Costa” suffered fatal bullet wounds to the head in an act that mimicked the sniper shots fired the day of the attempted coup against past President Hugo Chavez on April 11, 2002. It is important to note that the constitutional government of Nicolas Maduro has won both the 2013 Federal and Municipal elections. The Memoria Viva Society of Edmonton also denounces the corporate media that is equally implicit in aiding and protecting undemocratic leaders and promoting misinformation and violence. The corporate media of Venezuela along with international media outlets, continue to provide the public with biased accounts of the events of February 12, 2014. The demonstrators are portrayed as pacifists against a “repressive, corrupt and violent” regime and those leading and organizing the attacks depicted as victims and political prisoners. The Memoria Viva Society of Edmonton, Latin American refugees in diaspora, share common values with our brothers and sisters of Turtle Island. We are here today to declare our solidarity, and with them, to be forever Idle No More! As refugees, we are displaced peoples that have experienced the oppression of colonization and imperialism. With our brothers and sister we choose to bring attention to the destruction of Pachamama through the continued privatization of the natural resources of this territory, whose original peoples have the right to protect and defend. We support our brothers and sisters in their sovereign right to nationhood, to defend their land and assert their culture and language. Idle No More provides an opportunity for all people to re-think social, political and economic relations to include environmental, spiritual, and communitarian values as was prophesied by our ancestors in the story of the Condor and the Eagle. 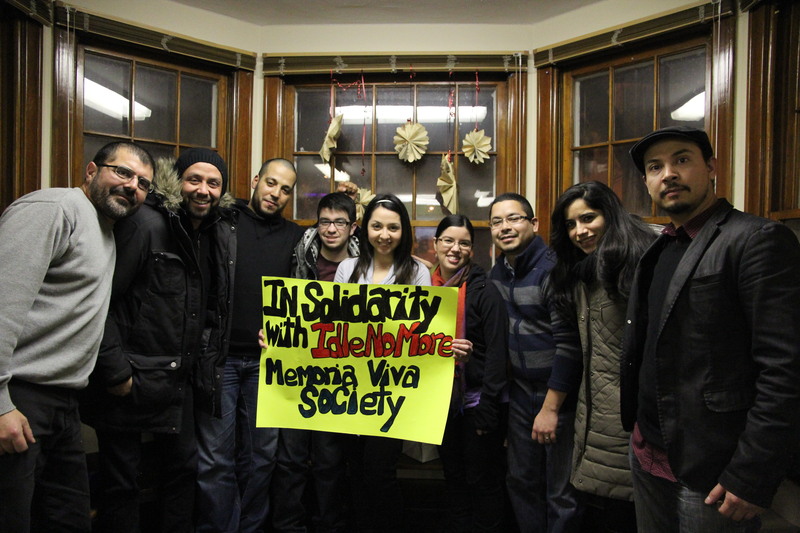 Memoria Viva Society of Edmonton forever in solidarity with Idle No More!